Important Note: Any changes made to the live timetable that are not included in a Timetable Construction file will be overwritten should you re-publish that timetable file. 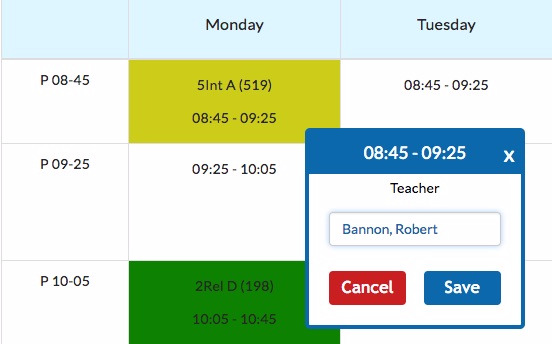 'Swap Teacher' will allow you to move a teaching group period from one teacher's timetable to another. To do this, navigate to the teacher's timetable that has the period you wish to swap. Enable 'Make Editable' through the Actions menu. Then simply click on the period that you wish to swap, you will see the 'Swap Teacher' option appear as below. When you select swap teacher, the system will give you a list of teachers to choose from. Firstly showing you all teachers that are free at that time. Letting you move the period to the selected teachers timetable. At the bottom of the teacher list it will also show you teachers that are already teaching at that time, and what teaching group they have. Selecting one of these teachers will allow you to do a straight swap, switching the teachers of both teaching groups. Once you have selected the teacher you want to swap the lesson with, click 'Save' and the result will be shown on their respective timetables. 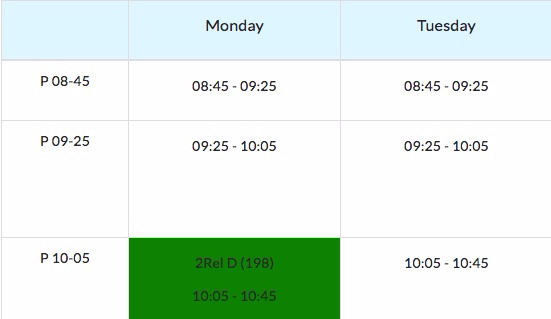 Below is a screen shot of this teacher's timetable after swapping 5Int-A to another teacher. The first period on Monday which we swapped is now empty on their timetable and has been positioned on Robert Bannon's timetable as we selected earlier. Note: You can also do this process the other way around. For example, if you want to add a teaching group period to a teacher's timetable. You can go to that teacher's timetable, click on the blank periods and use swap teacher to populate a timetable from that perspective. Use whichever flow makes the most sense for the specific situation.